When last we heard of “Mad Mike” Hughes, the 61-year-old limo driver and stuntman who planned on launching a $20,000 steam-fueled rocket with “RESEARCH FLAT EARTH” painted on the side some 1,800 feet into the air at 500 miles per hour, the gosh darn government had intervened to tell him he couldn’t conduct any such launch on public lands. But Hughes has not been deterred, and in a number of posts on his Facebook page he claims to have a real launch planned for February 3rd. This one will be a vertical rather than horizontal launch, which Hughes believes will prevent him from crossing over into public property and thus getting in trouble with the government. “That way we got enough buffer that when it lands, it will not be on [Bureau of Land Management] property,” Hughes said in a video last week. 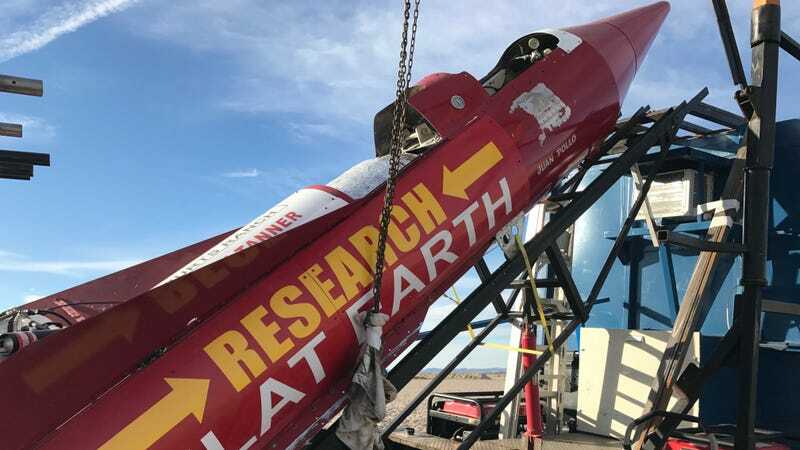 It’s still not entirely clear what Hughes intends to prove with the launch because, as LiveScience noted, observing the curvature of the Earth requires one rise some 35,000 feet (10,700 meters) above the ground. Hughes’ rocket will not be capable of attaining anywhere near that height, which is good because videos of his parachutes are far from reassuring.